The best low-carbohydrate recipes are those that deliver plenty of delicious flavor and satisfaction, while still being suitable for those who want to follow a low-carb diet. So we've scoured our records and rounded up the best low-carb recipes for appetizers, main course dishes, and even desserts. We think they're so delicious that you might start eating them whether or not you care about carbs. Just browse through our recipe collection and get inspired to cook and eat well, even when you're cutting back on carbohydrates. Authentic eggplant parmesan is a truly classic Italian dish that is popular all around the world. While you may have tried versions of this dish that bread the eggplant before frying, the traditional recipe, shared here, skips the breading, for a low-carbohydrate meal that really lets the wonderful flavor of the eggplant shine. You'll find this eggplant parmesan recipe lighter and faster to prepare than Americanized versions, but still hearty and filling enough to make a satisfying, meatless main course, together with a tossed green salad and perhaps some Italian red wine. Elegant and special, you'll impress your friends at your next dinner party or outdoor cookout when you serve this yummy shrimp ceviche recipe that's naturally low in carbohydrates and fat. Inspired by the seaside villages in Puerto Vallarta, Mexico, this exotic, fresh-tasting, citrusy ceviche makes a healthy appetizer or first course. Here's a rich, creamy low-carb spaghetti squash with bacon cream sauce recipe that is quick and easy to prepare, yet special enough to serve guests. Spaghetti squash cooks into long strands that resemble pasta noodles, without all the carbohydrate content of traditional pasta. Crumbled salty bacon and a decadent cream and Parmesan cheese sauce make this spaghetti squash dish incredibly delicious. Plus, spaghetti squash is super good for you, thanks to its high fiber and vitamin content. Serve this fabulous "spaghetti" dish with a tossed salad on the side, for a fabulous dinnertime meal. Philly cheese steak lovers, here's how to indulge in the flavors of your favorite sandwich, without all the added carbs! This streak and cheese stuffed peppers are made with all of the flavors you'd find in a Philly cheese steak, for a low-carb and gluten-free version that's super satisfying and delicious. Shaved steak, caramelized onions, and bell peppers make up the filling for these amazing stuffed bell peppers, along with optional sliced mushrooms and a topping of shredded cheese. Thai food is a take-out favorite, but so many dishes are high in carbohydrates thanks to noodles and rice. If you love classic Pad Thai noodles, and you're looking for a low-carb noodle dish, try this delicious low-carb Pad Thai Noodle Salad that boasts wonderful, bold Thai flavors and an abundance of textures, but keeps carbs to a minimum, by using rice noodles in place of wheat. It's also light in calories, low in fat, and naturally gluten-free. It makes a beautiful, colorful salad to serve as a side dish or main course salad, or for taking to summer picnics and potlucks. Eggs for breakfast, anyone? It takes just 15 minutes to cook up this low-carb, satisfying Mexican omelet that's sure to become a go-to recipe in your repertoire. Eggs are beaten with Mexican crema (or sour cream), Jack cheese and mild spices, then cooked until set and topped with salsa, for a quick and easy morning meal that will fill you up and give you plenty of energy. Chicken casserole is a comforting recipe that's a family favorite on weeknights and weekends. Grated cauliflower takes the place of rice in this tasty, low-carb chicken and cauliflower casserole recipe (but if you don't tell your family, we won't either). The one-pot dish makes the perfect meal for anyone watching their carbs and tastes just as filling and hearty as traditional versions. There's no sacrificing flavor either, thanks to a little cream, some cheddar cheese, and a variety of herbs that jazz up this casserole up and give it plenty of great taste. Here's a fancy party appetizer that you can serve to a crowd, for a healthier option that's plenty filling and tasty. Chopped crab meat, mayonnaise, and parsley make a simple and delicious filling for baked mushroom caps, for a flavor that's similar to crab cakes, but without all the extra breading. This recipe makes a big batch of 3 dozen, but it's easy to scale up for a larger party or event. If you're looking for an ideal appetizer or snack for a game day party or holiday celebration, these low-carb, crab stuffed mushrooms are for you! Healthy, mild tasting baked tilapia with garlic butter is an excellent choice for a low-carb diet, and a delicious dinner entree anytime. The fish is simply flavored with a light garlic and herb mixture, then baked in the oven, for a lovely dinner that's ready in less than 30 minutes. It's a wonderful choice for a healthy weeknight meal or last-minute dinner party, served with roasted squash or a side of easy steamed green beans. These garlic and pancetta stuffed pork chops are impressive to serve, but super easy to prepare, making them the best of both worlds when you're entertaining dinner guests. Pork chops are stuffed with pancetta (or bacon) and fresh herbs, then popped into the oven to cook. This low-carb recipe has a flavorful combination that's sure to please the most demanding eaters, and once you've enjoyed the compliments from making it once, you're sure to serve it again and again. When you feel like a hearty bowl of beef chili, this "mostly meat" low-carb chili recipe is just the thing to warm your tummy and leave you feeling satisfied. Low in carbohydrates and chock-full of meat, this is a thick and filling chili recipe that hits the spot on cold winter days. Tomato, Corn and Goat Cheese Spiralized Zucchini "Pasta"
When you're craving comfort food, but don't want to feel weighed down afterward, this light tomato, corn, goat cheese spiralized zucchini pasta entree will brighten your day. All you need is a spiralizer kitchen tool (or you can use a julienne peeler) to transform raw, whole zucchini into healthy, naturally low-carb and gluten-free spaghetti-sized noodles. More sautéed vegetables are added for a depth of flavor, and crumbled goat cheese adds a creamy tanginess to this dish. You can also add strips of grilled meat to this dish, for extra protein. Zucchini noodles cook super quickly, so dinner is ready in a snap. 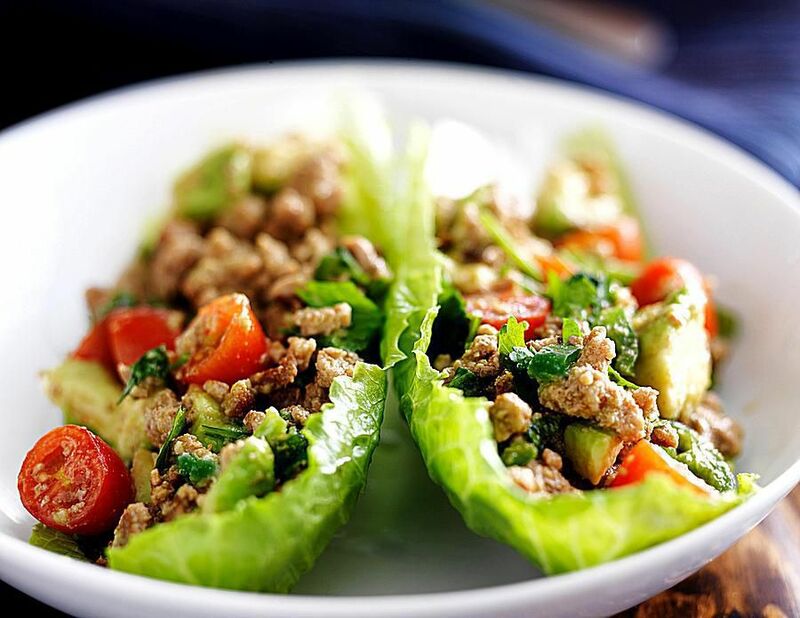 Thai basil chicken lettuce wraps take a traditional Thai dish that's often served on top of noodles, and transforms them into a low-carb, crunchy and delicious treat that's perfect for serving your family at dinner, or as a special appetizer at dinner parties. Chicken, fresh vegetables and herbs are stir-fried and then stuffed into "wraps" made of iceberg lettuce leaves, for a colorful, exotic handheld meal that's full of flavor. Can decadent tasting chocolate mousse really be low in carbs? It sure can! If you're trying to watch your carbohydrate intake, you can still enjoy this rich, healthier dessert option. All you need is whipping cream, artificial sweetener and cocoa to make this low-carb chocolate mousse recipe that's surprisingly sinful tasting, but can be enjoyed guilt-free. This simple roast chicken recipe proves that sometimes simple is better. What could be easier than simply mixing a few spices, coating the chicken with them, and then baking the whole thing uncovered in the oven for an hour, while you do something else? The result is a moist and flavorful chicken entree that everyone will love. It makes an impressive main course for guests, especially when the meal is surrounded by roasted vegetables. Or, make your family feel lucky and serve it as a special weeknight dinner. We may think eating tomato soup is always a healthy choice, but surprisingly there can be hidden calories and fat. This quick and easy, low-fat, low-calorie, low-carb healthy tomato basil soup makes the most of the sweet, natural flavors of tomatoes while delivering all of the nutritional benefits of this healthy fruit (yes, it's a fruit! ), such as high concentrations of anti-oxidants and vitamins. Warm, comforting and delicious, this soup makes a great companion for salads and low-carb wraps. A French cookbook classic, this staple recipe of many great chefs is a fabulous way to enjoy steak simply, for a low carb meal that's fancy and filling. Ready in less than 30 minutes, steak au poivre is the perfect main course for a romantic meal enjoyed at home when you'd rather focus on your date than on the stove. Shrimps are a party favorite and this easy, low-carb shrimp with creamy garlic sauce that's low in carbs makes a great appetizer or entree at your next dinner party. These garlicky shrimp take just minutes to cook, and the rich and buttery garlic cream sauce is heavenly to smell and eat. For a delicious low carbohydrate entree, try serving it on top of spiralized zucchini "pasta" or cooked summer squash noodles. Roasted butternut squash with sage is a flavor combination that's really special. This roasted butternut recipe is a snap to fix and is naturally low in carbs. Just toss cubes of squash with olive oil and sage, and roast, for a colorful and rich-tasting vegetable side dish that can be served with an everyday or holiday meal. You can also add onions (tips included in the recipe) for an extra lift of flavor. This classic French bistro recipe for Niçoise Salad makes a wonderful main dish salad for lunch or dinnertime, any day of the week. This Niçoise Salad recipe is an elegant, composed salad featuring protein-packed tuna and hard-boiled egg, briny olives, crunchy green beans and (optional) potatoes. You can omit the potatoes from the recipe for a completely carbohydrate-free salad, or leave them in for a flavorful salad dish that's still quite low in carbs overall and offers a balanced nutritional profile.